Publication details: Book. 2005. xiv and 140 pages. Publication date: 2005-07-01. 9 tables and 2 figures, of which 1 in full color Hardbound. 16x24 cm (6.3x9.4 in). This is the second Consensus Book published by the AIGS. It provides valuable guidelines for surgical management and has highlighted areas where scientific evidence at present is lacking. Recently, there has been considerable interest in new surgical treatments for open angle glaucoma and some have rapidly gained acceptance in clinical practice. Although some of these modalities are promising, one should always keep in mind that it is essential to appraise all new surgical treatments with similar rigo to that demanded of new medical treatments. 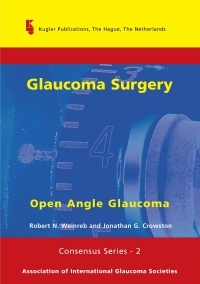 This consensus in glaucoma surgery for open angle glaucoma provides valuable guidelines for surgical management and has highlighted areas where scientific evidence at present is lacking. The availability of data from well-designed and carefully conducted surgical studies in glaucoma will further shape our practice. Reports for this consensus meeting have been prepared and discussed by a Consensus Faculty that consists of ninety leading authorities in Glaucoma Surgery, and each report was discussed extensively during the Consensus Meeting in Fort Lauderdale, Florida, USA on April 30, 2005. This book is the result of these careful preparations.